The Home Secretary has agreed a number of concessions to his drugs advisers after several walked out. 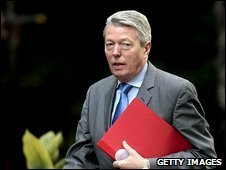 Alan Johnson has now pledged to write to members of the Advisory Council on the Misuse of Drugs to explain any decisions that go against their advice. He also said he would not pre-judge decisions on drug classification ahead of the committee issuing advice. Five advisers have now resigned over Prof David Nutt's dismissal for "crossing a line" into politics. The concessions were agreed between the Home Office and the Advisory Council (ACMD) on Tuesday, but announced on Wednesday. Following the meeting three more council members announced their resignations. One of the advisers - Dr Simon Campbell - said he had stepped down because decisions on drugs were being made on political rather than scientific grounds. The new protocol, thrashed out at talks between the Home Office and ACMD also included an agreement by Mr Johnson to give "careful consideration" to all future advisory council reports. From now on, advice will be made public at the same time as the Home Office receives it. It is hoped this will avoid quick-fire, pre-prepared government statements being released. Mr Johnson has also agreed to meet with the ACMD chairman before making a final decision if he thinks in advance he reject the council's advice. Earlier, Dr Campbell told the BBC home secretaries would listen to scientific advice - but had usually already made their decisions. He said: "When we made our recommendation on cannabis we saw no reason to change the classification and yet the government has already decided to move from Class C to Class B." "That can only be because the government saw it as a vote-catching exercise." The Home Office has confirmed the ACMD, which is down to 25 members, must have at least 20 members to function, and that six key positions must be filled for the advisory group to function. Prof Nutt was sacked last month after calling cannabis less harmful than alcohol and nicotine, and saying it had been upgraded to Class B for political reasons.